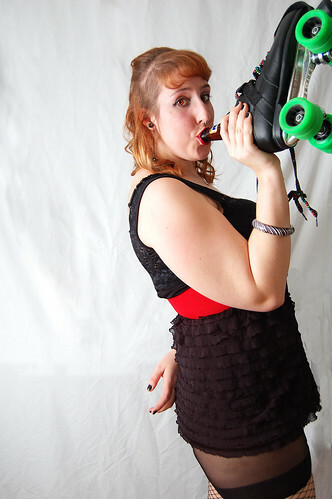 This is a picture of a Derby Doll named Ruca Von Riot drinking beer out of a roller Skate. She’s from a Newfoundland roller derby team called the 709 Derby Girls. You care because there’s just something about a heavier girl putting something phallic in her mouth that you just can’t resist, especially when it’s a booze bottle because you imagine that soon she’ll be easier pickings than ever, and you might actually get a chance to hit those birthing hips that society has been telling you are “unattractive” but appeal to your primal instincts to spreak your seed. I care because I have a thing for Derby Dolls because they’re feminine but they’re masculine, and they can rough me up in a way that reminds that sometimes I hate myself. That, and I also enjoy burying my head between a pair of thunder thighs and feeling them clamp down on my head. It takes my breath away much in the same way I imagine falling in love for the first time would. You can check out the 709 Derby Girl flickr stream here.